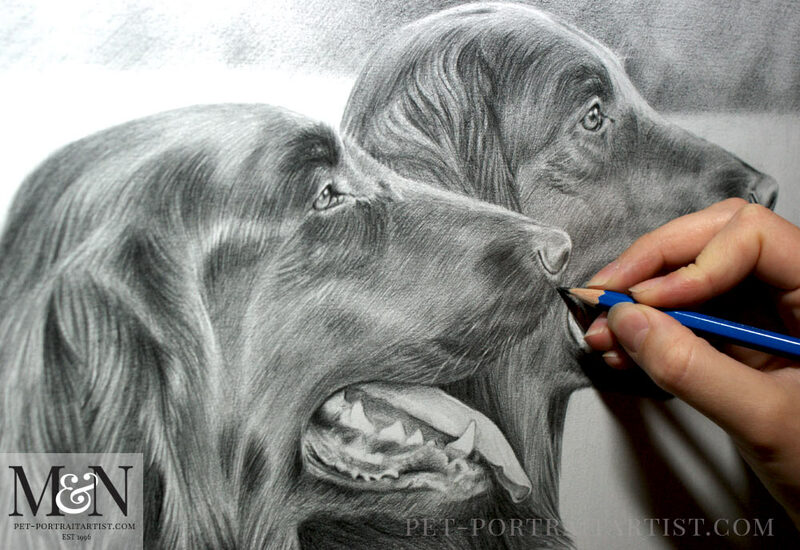 Welcome to my latest Flatcoat Retriever Drawing! This portrait was for a very special client with whom I have been working with for many years. 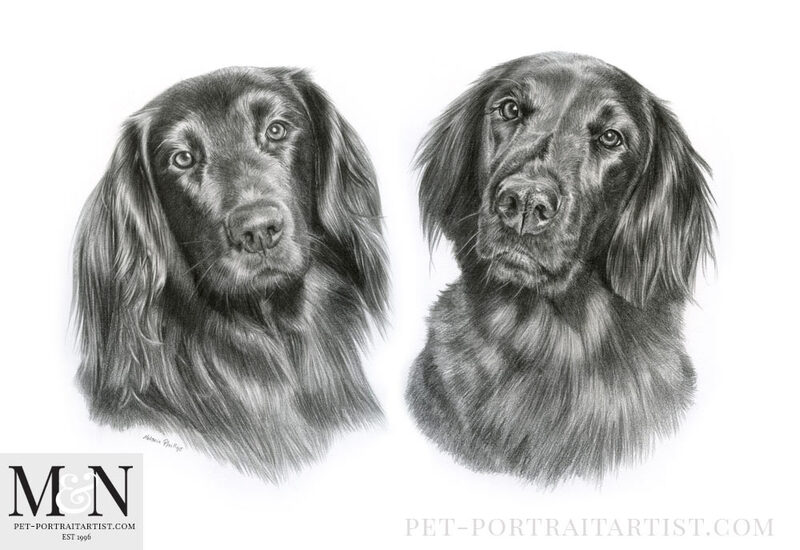 I have created a number of portraits for Mandy of her beautiful Flatcoat retrievers and also for her friends too. This drawing is of Liffey, who is sadly no longer with us. I really hope that the portrait will bring back wonderful memories for Mandy. Liffey was drawn in pencil at 16 x 12 size by myself, in both a show pose and a head study too. I took a photo of the final drawing along with some candid photos of the portrait too with my pencils to help show scale. I was in touch with Mandy via Messenger and Mandy sent me a number of messages about the portrait. We had been discussing the portrait for many months until Mandy was ready to commission a portrait of Liffey. She wanted to commission on the anniversary of Liffey’s passing which was lovely. Here are a few photos of the portrait taken on my plan chest here in the studio. They seem to come out with a bit more of a warmer glow when taken on an angle. 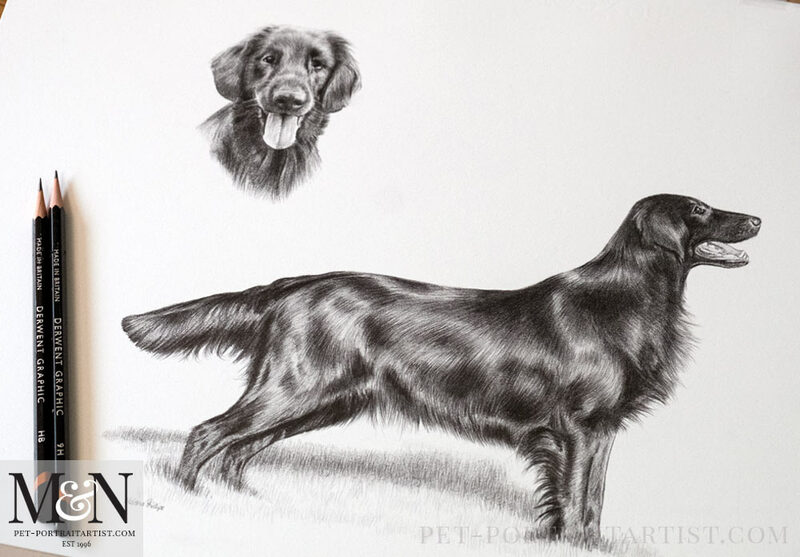 The portrait is now all packed up and has been sent to Mandy where she will frame it and hopefully display Liffey with the other portraits of her Flatcoated Retrievers that I have drawn over the years. I will add some photos below of some of the other portraits I have created for Mandy and her friends and other clients too. Keep scrolling to see them, I absolutely adore drawing Flatcoats! 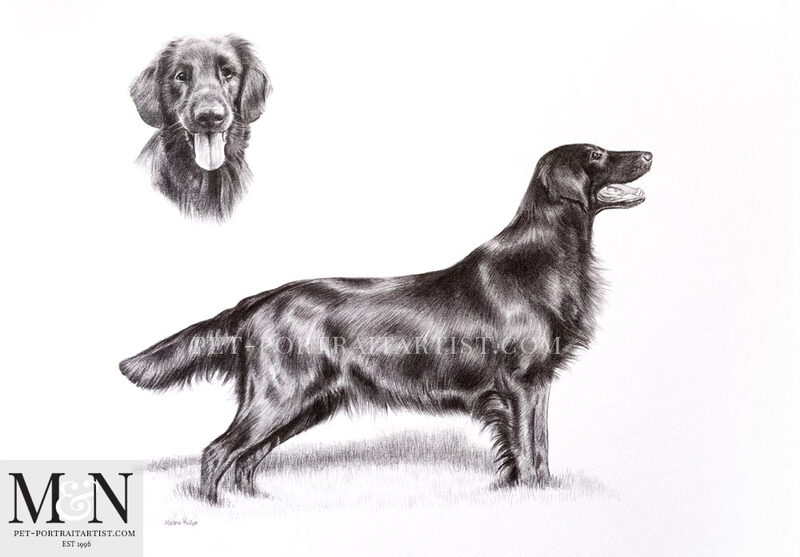 They are one of my favourite breeds to portray! I hope you enjoy viewing them all! 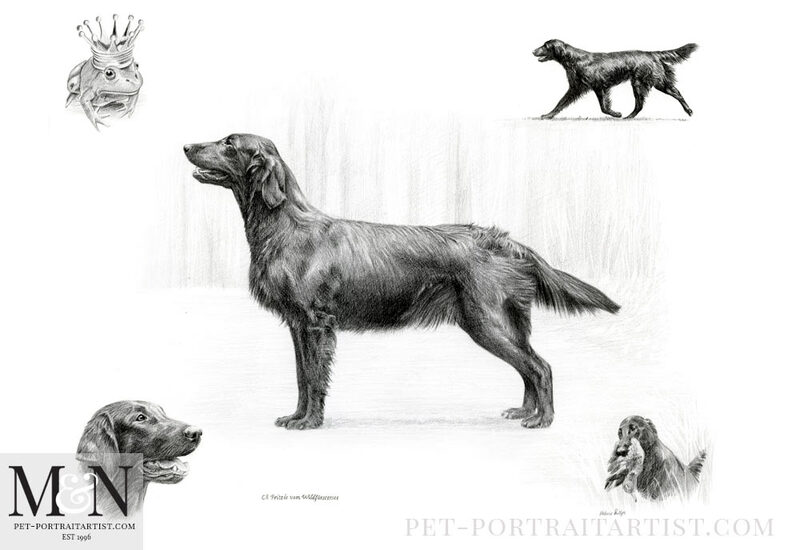 Flatcoat Retriever Drawings – Other Portraits by Melanie…. Here are just a handful of Flatcoated Retereiver drawings that I have completed over the years. Some for Mandy, some for friends of Mandy’s in the Flatcoat Retriever community. 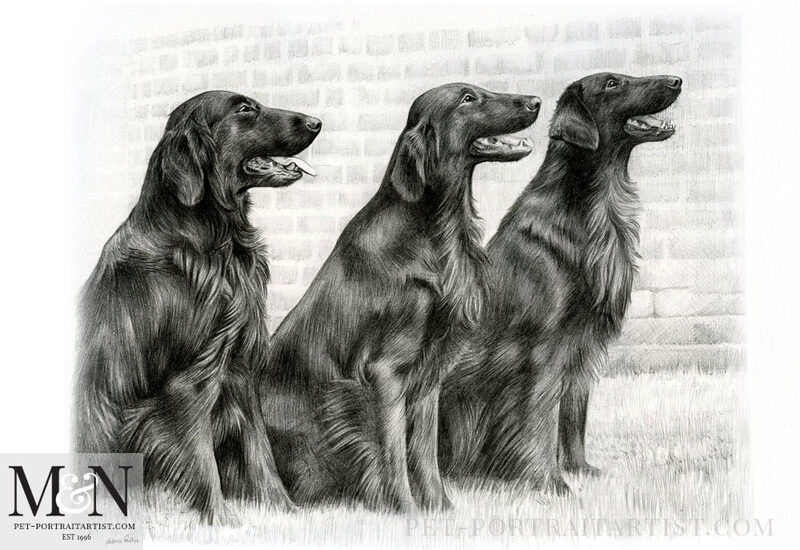 My favoruite has to be the two Flatcoats in the side on pose. The photo of them both was perfect for a portrait and such a joy to draw. You can see my hand in the photo below while working on the portrait. 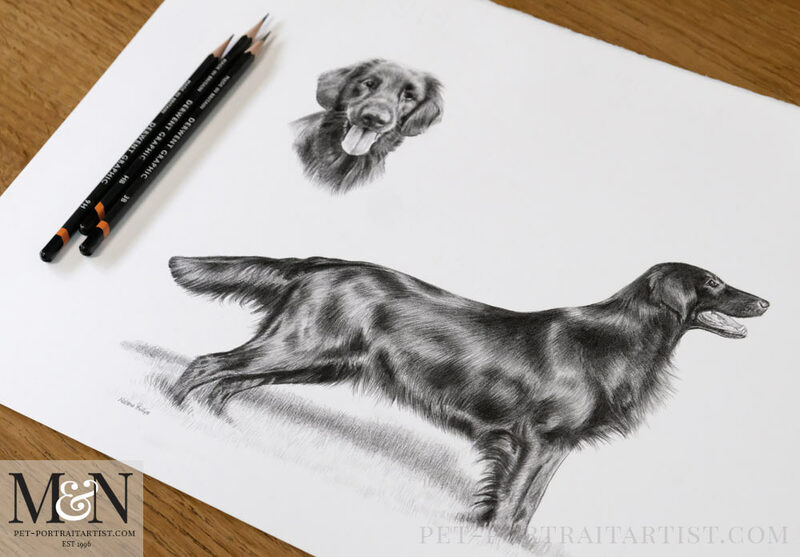 The drawing below was a commission from 2018 and you can read all about my portrait on a recent blog post at Flat Coat retriever Pencil Portrait. You can see other photos of the drawing with my pencils in a more candid way. This was a commission for a client in the UK and I really hope all of the family are still enjoying the drawing! Another of my favourite portraits was of ‘Frog’ the Flatcoat and it was commissioned by Mandy and all of her friends for a very good friend of theirs. You can see I drew a drawing of a frog in the portrait as requested! I think this was my first frog portrait!! The recipient was thrilled! 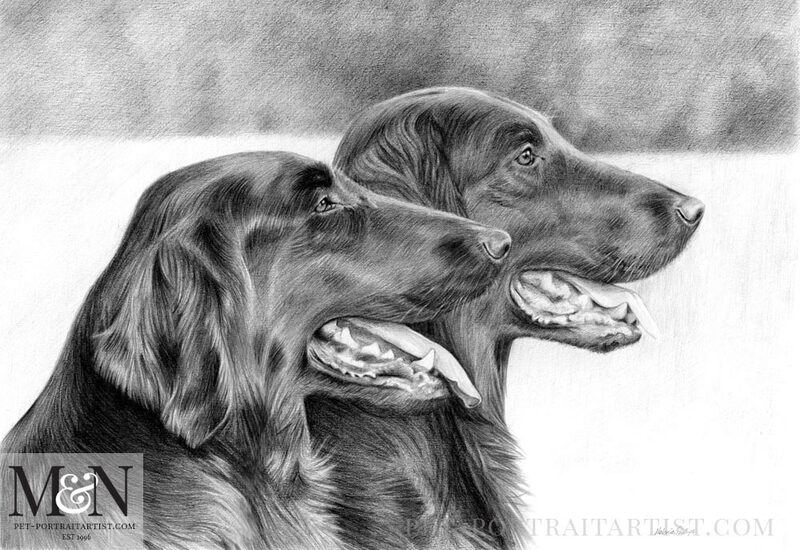 Finally, another specil portrait commissioned as a gift for Mandy of three of her Flatcoats. I hope that you all also approve of this one too! Thoroughly enjoyable to draw!